dance.net - Talking drums in Ghana - West Africa (4597417) - Read article: Ballet, Jazz, Modern, Hip Hop, Tap, Irish, Disco, Twirling, Cheer: Photos, Chat, Games, Jobs, Events! The picture you see is the talking drum. It really talks! It is used to communicate to a community either to assemble them or give important information. Its shape enables the membrane to sound over long distances and get everybody alert. 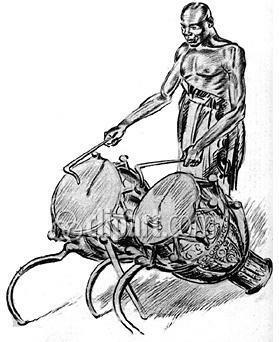 In some colleges in Ghana - West Africa, talking drums are used to assemble students for all ocassions. The talking drum consists mostly of two drums: the male and the female. They have different sounds, which gives distinct notes as speech. It is very interesting to listen to the talking drum. Because it is a means of communication for communities, the drums are played in the native language of the community where it is being played. Therefore each community have their own understanding of what the drums say. It's sounds truly amazing. I wish I could see it done.